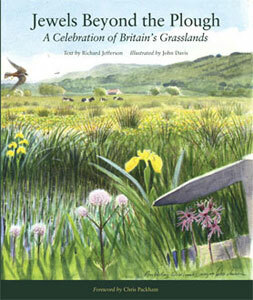 With a foreword by Chris Packham, this book is a celebration of Britain’s wildflower grasslands. The illustrations capture the beauty of grassland landscapes with their rich flora and fauna. A quick glance shows the remarkable range of plants and animals associated with wildflower grasslands. Orchids, cowslips, buttercups, fritillaries, pasque flowers, curlews, lapwings, butterflies, grasshoppers, waxcap fungi, mosses and lichens all feature prominently. It is hoped that this book will provide an inspiration and raise awareness of the beauty and value to society of our wildflower-rich grasslands. This book concentrates on and celebrates Britain’s semi-natural or wildflower grasslands which are made up of unsown, wild native plants. Two other types of grassland that are semi improved have been included in the book as they have significant wildlife or heritage value. These are coastal and flood plain grazing marsh, and water meadows. through. His skies are full of birds and insects, creating a great sense of joie de vivre. but think that 50 years ago the listing would have been to regions, rather than isolated nature reserves. ‘pightle’ is a small field, or that a ‘pleck’ is a local name in the Wyre Forest for a very small meadow? ‘..the magnificent illustrations whose impact is instantaneous and impressive…simply breathtaking. The secret of the fascinating text is not that it is so well written and easy to read but the fact that there is an underlying and important conservation message. This covers partly the rich and vital conservation value of grasslands but also the way in which they have gone or been drastically reduced by man, in so many areas.